Molecules, or singular units of substances such as proteins or gases, react to each other through a complex, and finite, set of properties. These include the electrical attributes that may repel or draw one atom away from (or toward) another; electrical charges acting on different chemical bonds, as well as a number of other smaller forces often named after the scientists who discover them (e.g., Pauli or Stark forces). These factors determine how different molecules interact, and, ultimately, build up what we think of as the matter around us. Molecular interactions are a fundamental component of chemistry. Advanced technologies allow modern-day scientists to visualize or project increasingly clear and accurate images of how different chemicals really ‘look’ based on them. In fact, they are even integrated into these techniques themselves. These improved imaging techniques may one day help scientists to visualize how different molecules really look like in their natural state. More traditional techniques, such as X-ray crystallography, have done a good enough job. However, the critical requirement of turning the chemical in question into a crystal in order to elucidate its chemical structure has its own set of problems. They may include fine deformations that may throw the desired image off by a tiny, yet significant margin. Furthermore, crystallography is obviously not suitable for substances that cannot form crystals, and scientists may or may not be aware of the limitations of the molecular or near-molecular imaging techniques that can be used. This issue could be cleared up if research could advance even further into the sub-molecular imaging arena. However, imaging at this scale would also require extremely miniature materials and methods to match, which is obviously a monumental task. But a group of scientists at the University of California (Irvine) may have risen to the challenge. This team, working at UC Irvine’s Center for Chemistry at the Space-Time Limit (CaSTL), harnessed a pre-existing breakthrough in the imaging of a single carbon monoxide (CO) molecule within a tunnel microscope. This unit of carbon monoxide was suspended on the tip of a tiny, super-polished needle of silver and positioned across from a flat surface of gold (Au (111)). This arrangement was blasted with laser emissions of about 600 nanometers in wavelength, and an incident intensity of about five microwatts per meter squared (μW/μm2). This, in turn, resulted in ‘refracted’ light beams of differing intensity that corresponded to the vibrations within and immediately around the molecule, or Raman scattering. The Raman data was then collected and used to generate images containing information on the vibrations, which corresponded to Pauli, dispersive and electrostatic forces acting on the molecule. 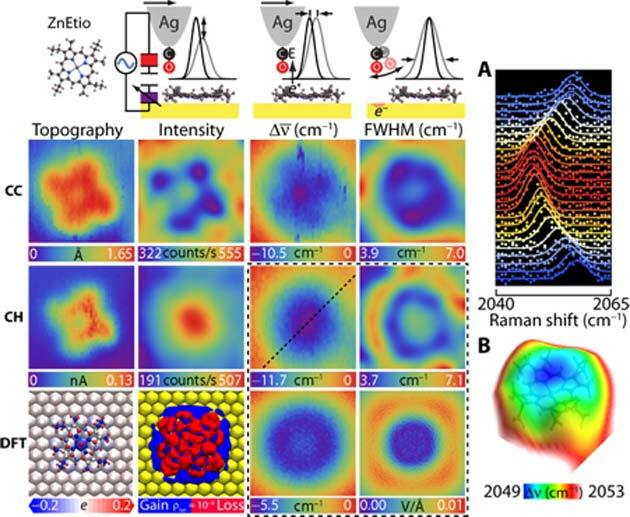 The technique, known as tip-enhanced Raman scattering (TERS), could also be applied close enough to the CO/silver apparatus that it could gather data at the resolution of the molecule’s individual atoms, and of the bonds between them. This generated images that somewhat resembled the ball-and-stick models that many chemistry textbooks use to represent these two components, but in real life. In addition, the scientists noticed that the CO molecule acted as a ‘spring’ as it was stretched out by its interactions between the silver tip and the gold surface. 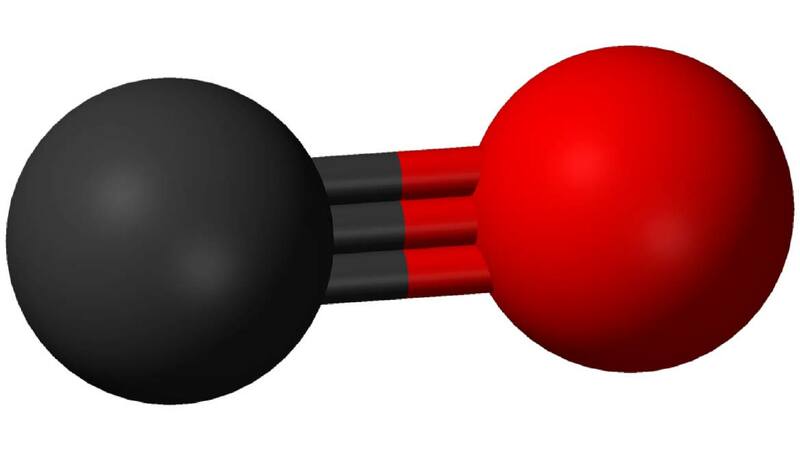 This form of molecular force is associated with the triple atomic bond between the molecule’s carbon and oxygen moieties. The springing motion is known as the Stark vibrational effect and was defined by a particular ‘line’ of intensity among the Raman-scattered light. The team realized that they could use this intensity to target other, larger molecules, and gain similar data on the interactions between their individual atoms. The ‘signals’ sent back from the Stark-effect intensity were incredibly detailed, but also incredibly faint. However, the silver needle acted as an amplifier and was able to enhance the intensity signals by a factor of about 12. This technique was termed TERS-molecular force microscopy (TERS-mfm). Therefore, the scientists set up another CO/needle/gold circuit that included a molecule of two types of metalloporphyrins. Metalloporphyrins are found in both plants and animals and may be important to the protein and molecular science of the future. Unfortunately, it has been difficult to get a clear picture of what they actually look like as free molecules in reality. For example, one of them, cobalt (II)-tetraphenylporphyrin (CoTPP) has been seen to ‘droop’ into a saddle-shape when it comes into contact with highly stable metals (e.g., gold) that are currently necessary for sample-mounting in high-tech imaging studies. On the other hand, another similar metalloporphyrin, zinc (II)-etioporphyrin (ZnEtio), does not do this. This is intriguing, particularly as the two are regarded as very similar in function. However, it appears that these two metalloporphyrins are very different in terms of molecular structure. The CaSTL group applied their new TERS-mfm technique to individual molecules of both metalloporphyrins, taking the analytical CO molecule to within 5.5 angstroms (a unit of atomic length; for example, the triple bond in CO measures about 1 angstrom). This resulted in highly-detailed data on the electrostatics, bond lengths, bond forces and other properties of both CoTPP and ZnEtio. This resulted in sub-molecular images of the metalloporphyrins as a whole and in terms of characteristics, such as the aromatic ring that forms the outer border of ZnEtio. The team also generated highly detailed chemical structures for both molecules using the density functional theory (DFT) technique. Both the raw and DFT-corrected images suggested that, while ZnEtio had a more rosette-like structure, CoTPP had more defined angles at four distinct, equidistant points. On the other hand, CoTPP again clearly assumed a saddle shape as a result of interactions with the gold surface. Nevertheless, these are the most detailed, high-resolution images of both molecules generated yet. These results indicate the potential of TERS-mfm in the imaging of even larger, more complex molecules such as full proteins. This new technique developed at UC Irvine may inform the next-generation, super-small-scale microscopy needed to image substances at the sub-molecular level. It may generate improved pictures of various macromolecules that can confirm or correct the data gathered on them from older studies using less precise measurements. In addition, the CaSTL scientists have also validated the results from previous work that led to the CO-based Raman scattering necessary for this new level of imaging in the first place. Hopefully, it will become even more accurate and refined in the future. J. Lee, et al. (2018) Microscopy with a single-molecule scanning electrometer. Science Advances. 4:(6). G. Kichin, et al. (2011) Single molecule and single atom sensors for atomic resolution imaging of chemically complex surfaces. J Am Chem Soc. 133:(42). pp.16847-16851. L. Gross, et al. 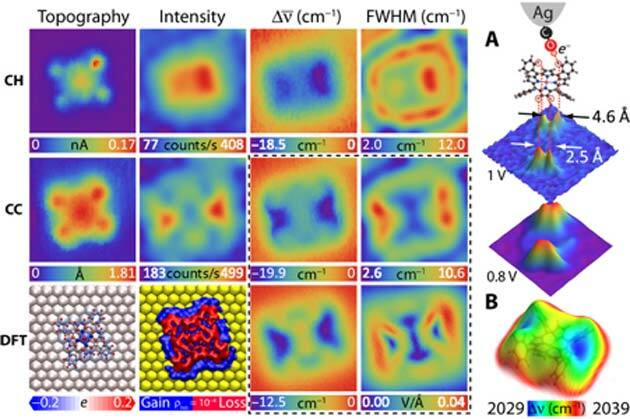 (2010) Organic structure determination using atomic-resolution scanning probe microscopy. Nat Chem. 2:(10). pp.821-825.